OK, back to color theory. 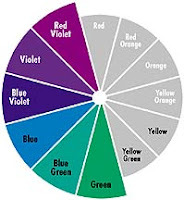 The color wheel is split into two halves --warm colors and cool colors. This is not just another arbitrary grouping as it would seem at fist glance. When Isaac Newton held a prism up to the window and saw that sunlight split into seven discreet colors, he was onto something. Onto something more than introducing generations of school kids to Mr. Roy G. Biv that is. He started a line of inquiry that resulted in what we now know as the colors of the spectrum. Different wavelengths of light result from different temperatures and yield the seven colors of the spectrum. The temperature of light is measured in a scale called degrees Kelvin. Red and yellow light burns hotter than green and blue light. 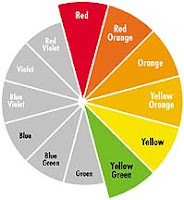 These temperatures are why the colors red through yellow-green are said to be warm and the colors green through red-violet are said to be cool. Sunlight, the picture on a TV, the halogen light I'm working under are examples of projected light. My black watch, green sweater and the taupe walls of my office are examples of reflected light. The color of projected light comes from wavelengths projected. The color of reflected light comes from the wavelengths that are absorbed and reflected back by an object. Projected and reflected light behave differently, but the language to describe them is essentially the same. In talking about wall paint, or carpet colors, upholstery colors or whatever; what we perceive as color is actually the wavelengths that are absorbed and bounced back by the object or surface we're describing. Pretty cool, huh? So becasue we're dealing in reflected light, the light sources under which we're operating have a huge impact on how colors appear. So keep that in mind. So far as painting and room design go, warm colors tend to advance and cool colors tend to recede. In English, warm colors make a room feel smaller and cool colors make a room feel larger. This works indepently of the chroma of the colors used. An intensely red room will feel smaller than the same room painted in an equally saturated blue. This warm and cold thing has given rise to all manner of pseudo-scientific hoo-hah variously referred to as the "psychology of color." Everybody's heard it at one time or another: "Purple is healing." "Red enhances your appetites." "Blue kills your appetites." "Couples fight more in a yellow kitchen." Most people hear this nonsense and buy into it uncritically, so why not run with it and start sticking pins in a doll while you're sitting in your purple "healing" room then? Unfortunately, this same malarkey gets lumped under the term "Color Theory," but don't be fooled. The actual psychology of color doesn't go a whole lot deeper than asking the question, "Do you like that color?" If a color makes you feel good, then it's a good color for you. If a color reminds you of something unpleasant, then don't use it. If you hate yellow and you paint your kitchen yellow, chances are good that you will fight with your spouse more. However, that behavior has nothing to do with the qualities inherent in the color yellow. There is no magic in selecting colors but there is a lot of science underneath it. Human brains are hard-wired to pick out patterns but our reactions to those patterns are determined as much by culture as they are by anything else. High contrast makes a human brain pay attention and low contrast makes a human brain relax. If you like yellow, or you like pink or purple or green or blue then by all means embrace what you like and work with it. Contrast keeps you on your toes, compliment calms you down. Old wive's tales and superstitions should have no place in this discussion at all. Or any discussion for that matter. The goal here is balance and comfort. And that, my friends, is that.